Nobody does network promotions like the folks at FX. This package arrived in today’s mail and the photo on the cover of the plain, brown shipping box is a work of art. The shot was taken by James Minchin, a Los Angeles-based photographer who has also provided key art for shows such as Mad Men, Sons of Anarchy, Black Sails and Billions. How effective are details like photography when it comes to promoting a show? 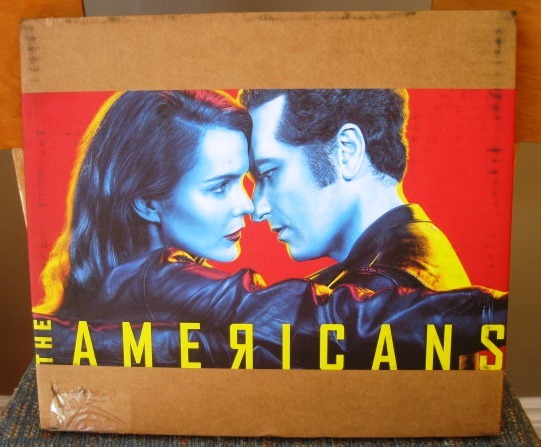 I haven’t even opened the box yet and I’m happy to tell readers that the period spy drama The Americans, starring Keri Russell and Mathew Rhys, returns for a fourth season Wednesday, March 16 at 10 p.m. on FX and FX Canada. Great photography isn’t cheap but FX gets how iconic images travel and sell. In the past, shows such as Rescue Me can probably thank great network ad campaigns for helping extend runs into sixth and seventh seasons. it is a lesson I feel is sometimes lost on Canadian networks, where shows fail to thrive because not enough was spent helping them through the clutter. In this so-called new “Golden Age” of television The Americans is one of those shows sometimes crowded out of the conversation–and thus worthy of and in much need of that extra promotional push. This is a consistently gripping, well-crafted, inspiring series starting with the writing and extending through the acting and right down to the precise, never showy, set design. If you haven’t already, dive into this world. Canadian viewers can catch up on the past three seasons on Shomi. A lot of the credit goes to creators/executive producers Joe Weisberg–a former CIA director– and Joel Fields, whose TV credits include Rizzoli & Isles, Ugly Betty and a couple of Steven Bochco’s later efforts, Raising the Bar and Over There. The Americans also boasts a Canadian executive producer: Toronto lad Graham Yost (Justified).